Poncho is a thing without which it is impossible to imagineWardrobe of a modern fashionista in the autumn-winter season 2013-2014. Because of its free cut, this garment perfectly suits women with different types of figure. 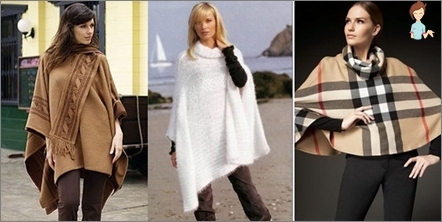 After reading this article, you will find out which poncho models are in fashion in the fall of 2013. If twenty years ago the poncho was a regular rectangle with a cutout for the head, then this season the designers offer Various forms, invoices and models. Therefore, every self-respecting fashionista simplyMust have in his wardrobe this stylish thing. 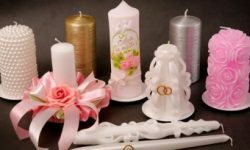 Moreover, fashion designers offer a variety of options for cuts and necks, pockets, hoods, fasteners, hand slots, collars, different lengths, cuts and material. All this allows you to choose the model that is perfect for you. 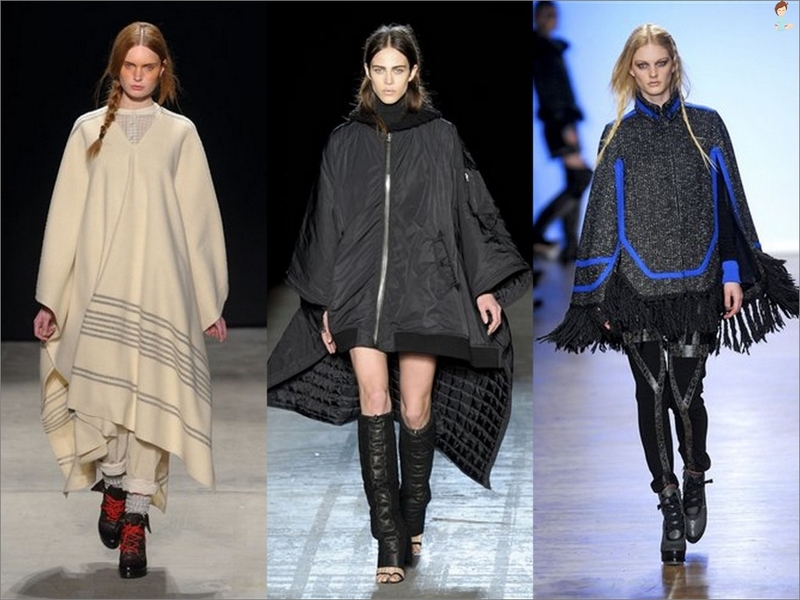 With the classic poncho models, fashion designers took Fringe decoration and ethnic ornament. On the world catwalks you can see models only from natural materials - such as Suede, textiles (linen, denim, fleece, wool, tweed). 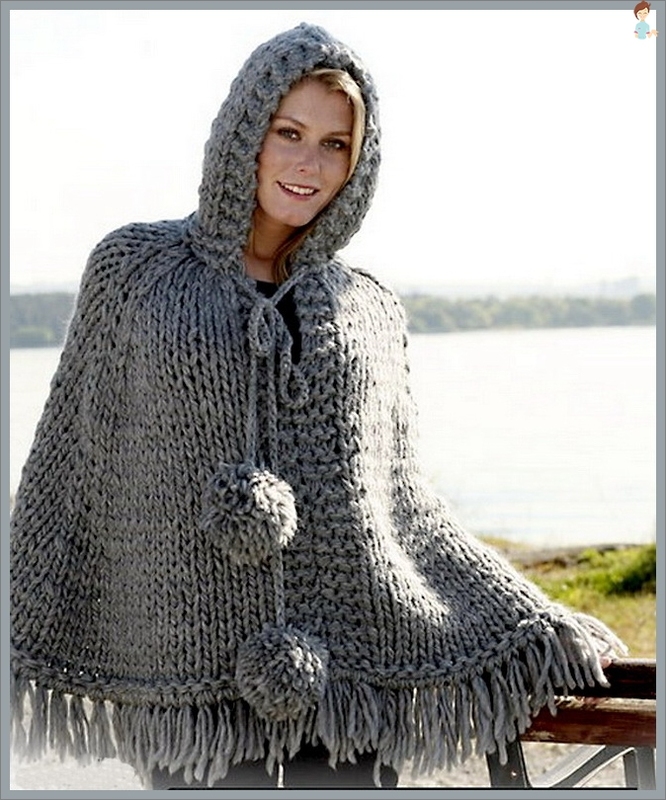 The most popular are knitted ponchos with large viscous, voluminous berets and long gloves. They can be seen in the collections of such famous designers as Marni, Salvatore Ferragamo, Temperley London, Vera Wang Etc. Lovers of needlework such a knitted poncho can quite do on their own. 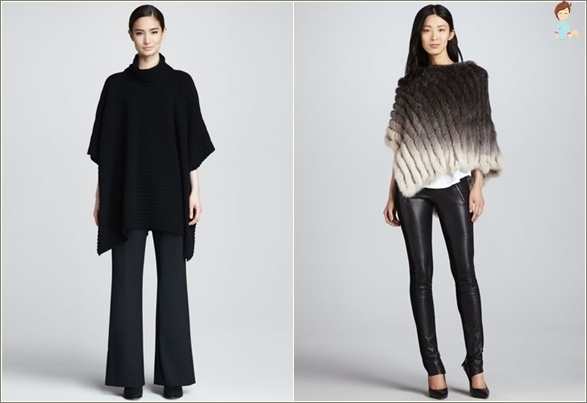 The hit of the autumn-winter season 2013-2014 are Woolen, draped and leather poncho, With enlarged shoulders. A strong poncho of fur will give odds to any fur coat and will warm on a cold winter day. As for the fashionable colors, in the collections of famous designers prevail Brown tones. However, the classical Black, white, gray and beige Color also is seen. There are models with a pastel coloring: Mint, pink, lilac and blue. Modern ponchos are a comfortable and practical model of clothes. After all, it is perfect for a trip to a social gathering, or for a walk in a park with friends. Besides, This kind of clothes is always in fashion, Therefore it will serve its owner not aloneseason. Poncho makes a girl extraordinarily attractive, but only if it is worn correctly, otherwise you risk being like a sack. So with what to wear a poncho? Pants. Long gone are the times when the ponchos were wornExclusively with jeans. Modern elegant models will look great with trousers and skins. Ideal option for them will be a knitted poncho with a large viscous, models of woolen cloth and with Mexican motifs. No less good with ponchos look leggings, especially if they imitate the skin. But trousers with a flare from the hip with a poncho do not wear, because your figure may look disproportionate. Skirts. 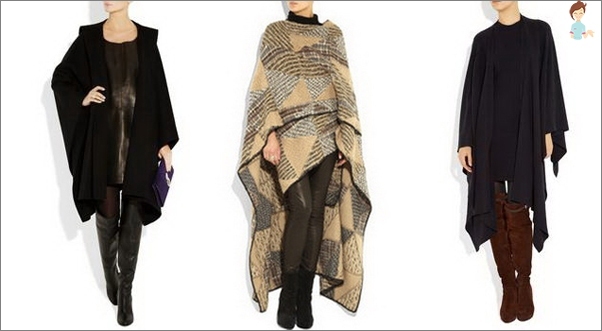 Ponchos are perfect for skirts with minimalThe number of decorative details, since the top cape gives volume. Also, the poncho looks great with monophonic miniskirts. This look will emphasize the amazing beauty of your legs. Pretty stylish looks with a warm ponchos skirt to the knees or a little lower. 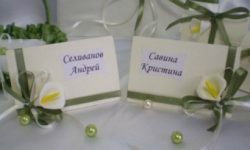 Ideal option for such an image will be skirts "tulip" or "pencil". But the trapezoid and flared skirts will not be the best choice. 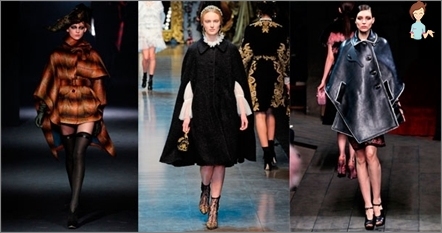 See: The most fashionable autumn skirts 2013. Footwear. So that you do not put along with ponchos, trousers orSkirt, your legs will always attract attention. Therefore, the selection of shoes should be approached very carefully. Firstly, it should visually make the legs longer, and secondly it's great to approach your general image. For tall girls, ballet shoes or moccasins along with ponchos will be an acceptable option, but women with lower-than-average growth should wear high-heeled shoes. Knitted ponchos are perfectly suited for high boots or boots from suede or leather. Accessories. With a poncho is not recommended to wear such jewelry,Like large beads or catchy pendants. 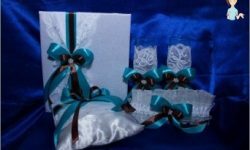 The choice of neck scarves and scarves should also be approached with care. The main thing is that they are in good harmony with your poncho. In the cold season, long gloves will be an ideal option for a poncho.